“In Scandinavia, St. Knut’s Day marks the end of the Christmas season,” says bartender Dave Shenaut. “Christmas Trees are taken down, and a tradition similar to trick-or-treating is observed—adults and children go door-to-door to their neighbor’s homes and are invited in for festive snacks and beverages.” As a nod to that tradition, Shenaut created this cocktail—perfect for ringing in the New Year. Combine the first 4 ingredients in a shaker. Add ice and shake well. Strain into a chilled coupe, top with prosecco, and garnish. Dave Shenaut, Raven & Rose, Portland, Oregon. 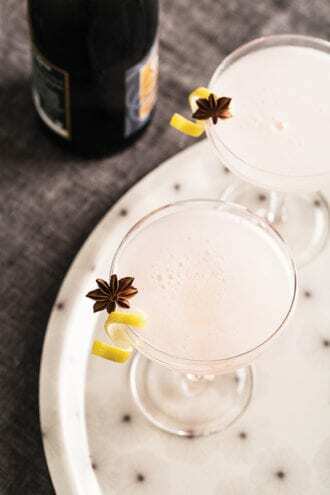 Reprinted from Cocktails for the Holidays: Festive Drinks to Celebrate the Season by the Editors of Imbibe Magazine. Hopped Grapefruit bitters flirt with floral pisco in in this Negroni riff from Texas.